How Gary Ling Can help you with your Business Intelligence projects - Gary Ling, Digital Producer, Data Monetiser, Political Savant, Information Economist, Solution Seller, Business Strategist. Gary works on short business consulting, ad hoc advisory projects on a variable day rate depending on number of days contracted per month. Gary can also be integrated more fully into your organisation and be given operational responsibility. He will also consider fixed price work for projects with measureable outcomes and definitive timescales. Gary can add value to your organisation with his experience of working on Business Intelligence projects. Essence? Business Intelligence (BI) is the ability for an organization to collect, maintain, and organize knowledge. 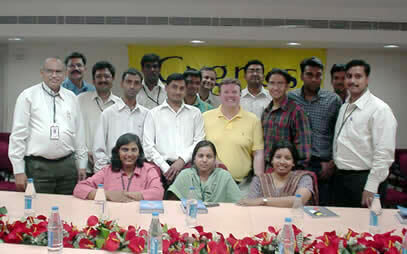 Working with the Indian industry intelligence team at checkOnomics (pictured), we developed an enhanced version of BI called 'Infoworking'. This is the process of building value adding or business relations amongst individuals OR organizations which not only search for and use knowledge in their profit seeking activities but are also prepared to share knowledge and opinion with others about the worth of that data. Education? As a platoon commander in Northern Ireland, I got my first taste of the value of intelligence in supporting strategy. In fact it's fair to say that my life and those of my guys depended on it. Unfortunately, it was clear to me that I often read better intelligence reports from David McKittrick in the Independent on Sunday (particularly on Libyan arms sales to the IRA that found their way on to the streets of the province) than that from the briefing given by intelligence officers. The lesson? Each person needs to ensure that they have access to the best BI system that they or their organisation can afford. Experience? From starting early in my career working on BI projects (see below), my experience in this area was consummated in the recent work that I have done with the Global Business Intelligence network setting up BI sites that focus on company credit checking (checkSURE) and risk assessment for global industries (checkOnomics). Solution selling and marketing Business Intelligence products is one of my sweet spots! Event? Working as a junior researcher with Andersen Consulting on a report into the impact of the Thatcher Government's Big Bang Reforms for the City of London. Two aspects of this business intelligence exercise still resonate with me. First, use of Lexus-Nexus proprietary database technology where each search for a piece of information cost £1 (inflation adjusted to £2.06 in 2011!). I thought this technology was extraordinary and couldn't imagine how a bigger database of press clippings, company filings and news could possibly be created (which is why I never invented either the Internet or Google!). Second, how right the senior consultants on this project were about how the US investment banks would move in and take over the traditional UK 'Merchant' banks as a result of the reforms. I had a small part in generating some BI that made some people a huge amount of money!